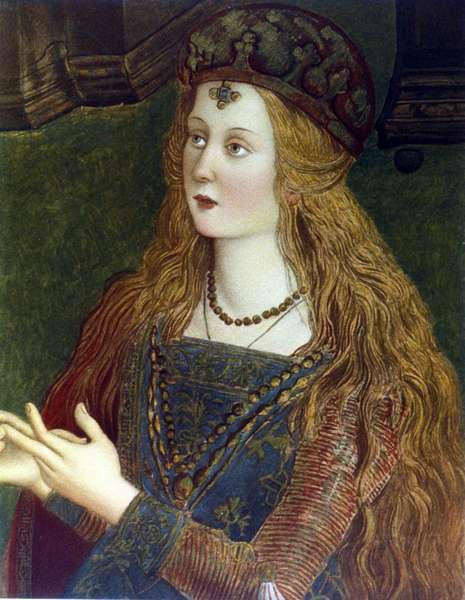 Lucrezia Borgia (18 April 1480 – 24 June 1519) was the illegitimate daughter of Rodrigo Borgia, the powerful Renaissance Valencian who later became Pope Alexander VI, and Vannozza dei Cattanei. Her brothers included Cesare Borgia, Giovanni Borgia, and Gioffre Borgia. Detail from 'The Dispute of Saint Catherine of Alexandria with the philosopher, in front of the Roman Emperor Maxentius.